The twelfth and final sign of the zodiac is Pisces (Feb 20th-Mar 20th)and it is symbolised by the fish. It represents the end of the circle yet is also the sign of rebirth, eternity, and reincarnation. Pisces are believed to be more in tune with the spiritual world than any other sign. Much of their energy is spent on their inner spiritual journey. Pisces are truly old souls who may have so much experience because they have lived past lives. 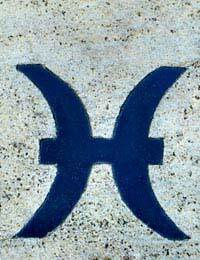 Pisces are very sensitive and have the ability to read others well. When they have a hunch, you may want to go with it, as they are very intuitive, perhaps even psychic. They have a natural gift of prophecy and are many times involved in the occult and spiritualism. This may have to do with the fact that they are ruled by Neptune, the planet of mystery. Pisces are influenced by the environment around them and the people in it more so than any other sign of the zodiac. They have a great ability to empathise with others and are themselves pleasant and easy going people. However, they are often misunderstood and can become downhearted because of it. Pisces love to dream. They are very creative and artistic people and their imagination often runs wild. In fact, they may have a problem at times distinguishing fantasy from reality. They tend to go with their emotions and instincts rather than their rational and intellect. Pisces make great writers, artists, and musicians. Pisces are very compassionate towards others. They have a sense that seems to let them get inside another's skin to understand how they are feeling. However, they get so into other people's problems, they often lose strength they need themselves. Pisces are very impressionable and are susceptible to almost anyone's sob story. Being so empathetic, it is often hard for a Pisces to turn down someone they think is in need of their help. They may find their self-sacrificing ways and caring nature is often taken advantage of by others. Due to their naïvety and need to help others, Pisces may become depressed and disillusioned when someone cheats them or betrays their kindness. It can lead a Pisces to question his or her own nature and that brings about confusion and anxiety. They may, if hurt enough times, begin to distrust others. Because they often live in a dream world, they may be impractical and lazy. They may lack confidence in themselves at times and that leads them to be loners. Feet - Pisces tend to have beautiful feet, but they are vulnerable to problems such as aches, bunions, and corns. Pisces should avoid shoes that are ill-fitting. Hi ... im also proud to b born under the pisces sign...... im a hopeless romantic.... i started chatting to a scorpio guy on fb about 2 weeks ago..... we have been friends on fb for a few years now... can you believe... we are dating nw... we click so nice.we started out as chat buddies... he was stubborn as hell... but i managed to get him to open up. He askd me to be his girlfriend... he said no one ever really got him to open up like this..... but me. Love and happiness is everything to me...... #bring on th Love peeps.... md yah scorpio balances the pisces world perfectly. It is so nice to come across this post. I'm reading the comments and they remind me of me...I too feel very lonely most of the time. I also feel misunderstood 99% of the time. I long for true love, my hope is wearing thin. I'm very passionate about my beliefs even though not to many people understand. I don't know if I'll ever have closer or true understanding but that seems to be what I'm fighting for. I'm a feeling person and I have a very strong desire to love and feel loved. I don't know where this is going. I feel I'm here to witness the ride. I met a Pisces 2 months ago when I was traveling for work. He was the one that initiate the friendship and since then he ha become something that I have never experience. He became so different after the first month. He wanted his space and then drifted away from the friendship and started to become very abusive verbally. He also blocked me for an entire week from his social media. He is very cold and selfish. When I need my space that is not acceptable but when he needs his it's his way or no way. Now I want to see him and he makes it seems like I can but only on his terms. I am so good to him and also very respectful and it doesn't matter to him. I am always sharing how I feel and how he is behaving and for that he ignores me or punish me by eliminating me for a week at a time. It's truly sad to see a grown man behaves this way to someone that are so loving to him. I can't stay around any longer it hurts too bad. My husband is a Pisces . I am a Virgo . This is a second marriage for both of us . We have both been hurt and cheated on in our previous relationships . We have been married four and a half years . This describes him very well ! I love him with all my being . I sometimes feel disconnected from him because he is a very private man . he is oftenlost in his own world always on his phone surfing the net or so he says . His job sometimes requires him to travel out is state . 5-14 days differs . I have never accompanied him on any of these because he says we can't afford it. We have money for everything else and other unexpected finances . My gut sometimes tells me is he cheating on me but when I ask him he gets upset . I do not have any solid proof .I ask why do you get upset ? He responds because it's offensive. He swears he would never hurt me like that . Says he would break up with me first ! So ...What the hell ?! Am I supposed to accept that and just live my life in fear he will just come home and say he's leaving one day ?! He spends hours outdoors doing yard work maintaining our beautiful home . He likes to do it all himself and refuses help from anyone.I often see him textingwith a smile on his face yet he claims he is cleaning his emailing or searching for music . Hmmm in the middle of yard work ? I appreciate him and everything he does for me to the fullest ! I am disappointed in myself for feeling insecure but how can the feeling I have in my gut be so strong if it's really nothing ?He acts very distant from me upon return and will justgive me a peck on my cheek or top of my head when I pick him up at the airport and goes to bed alone at night claiming he is tired . We don't snuggle much anymore . His choice . I try but then feel rejected when he puts a pillow between us or scoots to the edge of the bed. I despise feeling like this and like I don't trust him ! I understand completely a Pisces or anybody else for that matter needing space . Could I be wrong am I picking up on all the wrong vibes because of my past ? He claims he loves me to death ... He is a master of poker faces . I smile everyday but I feel like I'm dying inside .I'm normally not a insecure person and have been taken advantage of in my past by different people for being to trusting . I'm sad . How can I talk to him with out giving him the feeling I am accusing him of infidelity? I have never been more in love !! The last thing I want is to hurt him or for him to withdraw further from me . It has been a very spiritual journey for myself as a Pisces. Born 2/25, I have seen so many aides of myself throughout my life. Those who have not yet identified with some of the aspects of this sun sign are either not far enough along their journey, or are very much holding true to the easily wounded side of this sign.I have given my heart to so many, love the idea of love, and been hurt when my "ideals" have crashed and reality has set in, realizing they were never who I dreamed them to be to begin with. It completely makes my day to make someone who seemed unhappy, happy....even if just for a moment, and always try to lift the spirits of the sad or defeated among me.I love to paint, and will put in earbuds while doing so in order to lose myself in the creative energy coursing through me and "get it out" so to speak. But alas, I am my own worst critic and am never fully satisfied with my work. I always feel misunderstood or taken for granted, and believe that I need to live alone by the ocean and only interact when I feel energized enough to do so. I wear myself thin and have been left holding debt and heartache when giving to someone or something with all I have and will go into a depression for months to build back up, and then repeat it all over again.I am happy to be me, and I embrace all parts of who I am as a Pisces. I encourage all of my fellow Fish to do the same! You are beautiful and strong! I'm Christian Baptist, don't consider myself lazy or impractical, and renounce my faith three times and excepted the Holy spirit and Holy ghost in my life, for he guides my life. So true, nobody but a pisces can understand the natural desire to pretty much self destruct and to almost literally just drift, i also dont believe any but a pisces can know the unbelievable heartache when betrayed by someone you totally gave ALL of yourself to, yet still love them unconditionally, just drifting through life unable to understand why they cant see that no one else could ever possibly care as much as you do, day in, day out just hoping that you can hold on just long enough for them to realize that love was as pure as it gets, because with each day our grip on life becomes weaker as the emptiness grows colder. That all above are true about me.i am too helping.i understand what people are thinking.i love a aquarius boy so much.but he cheated me.he broke my trust thats why i feel lonely.and i like 2 live alone. Love this and so me :-) I'm a huge dreamer and don't trust many people, been burned to many times.I have a farm which fulfills my earthy nature and my loner side.A perfect life for a Pisces as far as I'm concerned :-) Boy wish I would have read this year's ago and I would have saved myself years of heartache with dating the wrong match men :-p Thanks for the read I greatly enjoyed it! This is nothing like me. I was born 3/1 and everything this says does not decribe me I am very short timper and I am only nice to some people. I only trust 3 people in my live. I don't help others who do not help me!! ths is totally me! 3/16. this post has allowed me to see myself on paper and know now better how to deal and control my feelings, emotions and life. everyone s different and everything may not! apply to everyone but for those who it does. I wish you luck on your journey of fulfillment and growth. my life has been in turmoil because of my trust and compassion for others! being a rocl for others has turned my life to dust. and with this I found some needed answer of my inner self. thaks! @fatkat. Interesting...we know quite a few 'assertive' pisceans too! The Dreamer, creative mind is true.Ideas are this Pisceans thing.BUT "lazy"...definitely not.However, with a Capricorn Mars I understand where the willpower and need to start and finish a project til the bitter end comes in.I don't align with the "flighty" Pisces definitions at all.I am someone who likes to lead and if a group is standing around not knowing what to do, I have to step up and take charge.Maybe that's the Leo Rising in me, who knows. In all, the two inherent Pisces traits are the Compassionate care-giver and Creative mind.Beyond that...lazy, flighty, lacking analytical skills, unfocused, ungrounded - definitely NOT this pisces. Am happily coupled with a Taurus as well.We are a powerhouse team.In that team we each lead in our specialties.One manages the food the other manages the technology.Works out really well. This describes my mom and my aunt to a T.
it perfectly represents me... and specially " they may be impractical and lazy. They may lack confidence in themselves at times and that leads them to be loners." this i big reality about me... but i think i'm very talented but fail to work steadily, give off very soon. The features of a pisces has fully described exactly who I am, my question is this. Can a piscesbe everly compatible with a cancer in terms of marital aspect? I will be looking forward to get a prompt response from you. Thank you.